Anyway… in a Facebook thread, me and a bunch of other geriatrics were reminiscing about the first FCP versions we used. In the course of this trip down memory lane, I did a search for the spot and… holy crap, it was there. On the Internets. So, here it is. From late Jan or Early Feb 2000. Probably FCP V1.2? 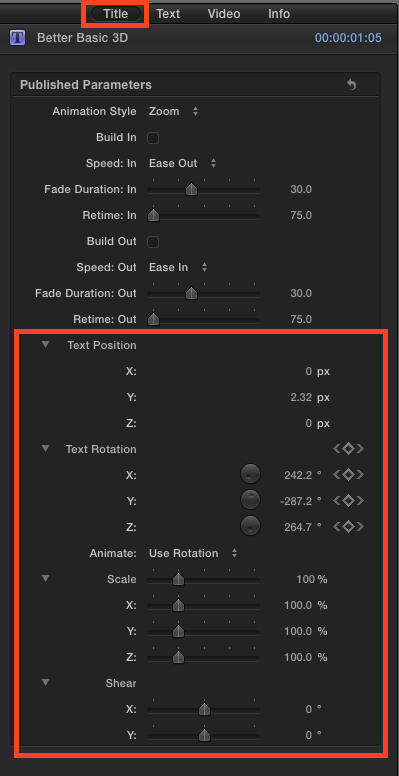 Anyway… at some point I made a quick little animation to show what you could do in FCP X without leaving the NLE. It literally takes 10-15 min to whip up a decent looking animation, and I’m sure it would look better if you spent more time. NOTE: The stock Basic 3D Title – which I used for this – has no X/Y/Z rotation keyframes. 3-animate it as 3D text. Again, other than making the font, this was all done in FCP X without using any 3rd party tools or other programs. It’s very easy. Apple certainly doesn’t advertise FCP X as 3D modeling software, but it’s pretty cool what you can throw together without leaving the timeline. 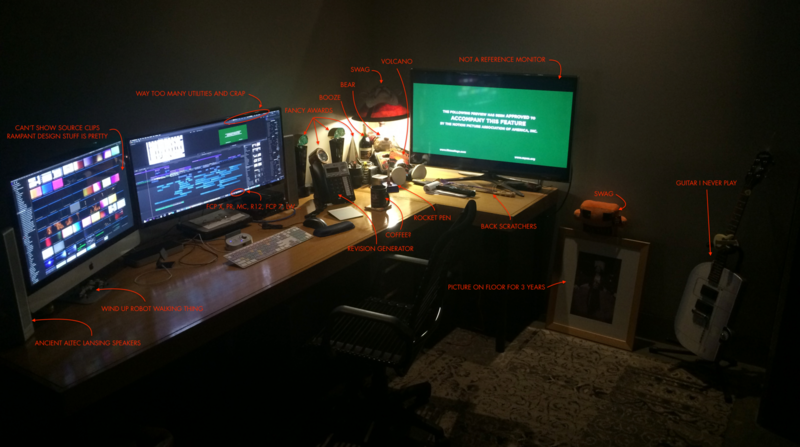 None of this required rendering either, which is a bonus. Here’s the 15 min process condensed to ~1 minute. Props to whoever made the original Star Wars gif, which can be found here. And the green screen thing is here. Make your own, have fun! Previous Update: Version 3 now renames Audio Components to match your Roles and Subroles. Components with existing custom names can be renamed, or left as they are. 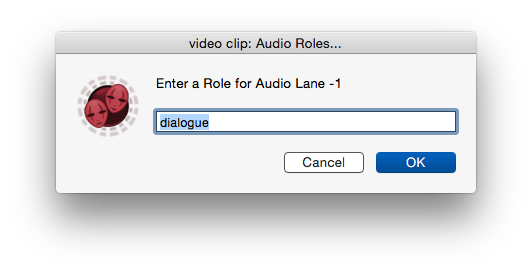 Ever need to set audio Roles on lots of multichannel clips? Open each one in a timeline, set the Roles, repeat ’til the end of time. Role-O-Matic ends the drudgery! This little app allows you to batch apply common Roles and SubRoles on any number of A/V and Audio-Only clips, even if they have different channel configurations, all at once. If you have 6 reels of a DME split feature, tons of dailies or location audio, you can now set the roles on all channels in all the clips at once. It also names the audio components to match your roles and subroles, so you can see what they are in the Inspector and Timeline. Put all the clips in an Event, Export fcpxml, run it through Role-O-Matic, and reimport. If you don’t understand why you would need this, don’t download it! If you do understand why it’s useful, I think you’ll like it. The code that does the work was generously donated by someone smarter than I, so it’s probably not gonna change too much unless you are a coding guru and want to help me with it. It works great, and doesn’t modify any files or change your original fcpxml, so it’s pretty benign. It’s very easy to use, but please read the instructions carefully. They’re with the app or you can click here to read or download them now. Click Here to Download Role-O-Matic 3. Current known issues listed below. Will update here and in the app read me as needed. Using spaces and other “illegal” characters may result in no Roles being set. 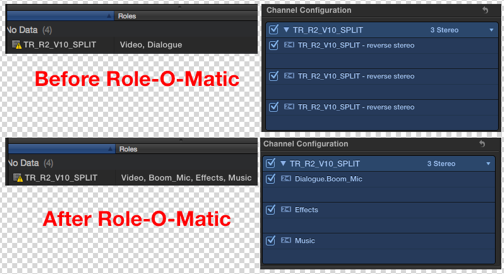 If you have files with interleaved stereo channels that are actually dual-mono, such as a lav on the left and a boom on the right, or interleaved surround files etc, Role-O-Matic cannot add separate Roles to each component, only to the “master” component. If clips have names in their metadata, and are then renamed in the inspector before you export xml, it puts the custom name in another element that ROM won’t change. For newly imported clips it should work as expected. Worse comes to worse you can always batch name ’em in the inspector though.. When reimported, stereo components/channels may be labeled “Reverse Stereo”. This isn’t caused by R-O-M, it happens even if you just re-import your original fcpxml. The stereo imaging is not changed, it’s just labeled incorrectly. I’ve sent feedback to Apple on this, you should too. It’s beta-ish, Please let me know if you have any problems not noted above. I like the new 3D titles in FCP X, not for making ridiculous extruded atrocities, but for just a subtle touch. It can really make your text look better. The preset animations are pretty good too. Sometimes though, you want to do your own little moves, and the titles from Apple don’t have any keyframe-able scale or rotation parameters. Even the Inspector’s Video tab only has a single “Rotation” adjustment. Which NLE’s Gracefully Handle Renamed Files? A Shootout! FCP X 10.4.1 – Open Apple? FCP X 10.4 Announced – Let The Whining Begin!